A Book Lover s Guide to New York is a love letter to everything literary in New York City. It is a book all about books. The book is an object in itself, designed as the ultimate little tome any book collector would love to acquire, layered with witty Pierre Le-Tan drawings, as well as photographs of some of the most precious bookish locations. Rediscover New York in the most fashionably literate way: whether you are in need of an exceptionally rare edition of your favorite novel (perhaps to be found in the dark and musty backroom of The Center for Fiction), or the most tranquil place to devour a short story on a wintry day (an empty underground food court in a Midtown skyscraper), or if you are looking to follow in the footsteps of a beloved author or novella character (like Capote s Grady and Clyde in Central Park Zoo), this will be your ultimate companion. 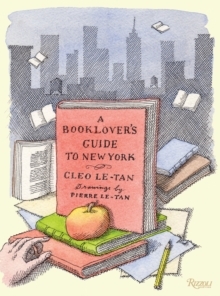 Part guide, part sophisticated scrapbook and part desirable object, A Book Lover s Guide to New York is an absolute must for any book-savvy person the young bookworm or old scholar, the visiting tourist or homegrown New Yorker, the aspiring writer or doting parent.